If you have ever ran a custom ROM on your Android device, then you may have seen a nifty little feature that would allow you to place a battery bar along the top of your device’s display. The bar’s color could change depending on how much charge you had left, and it was just a nice little aesthetic change you could perform to switch up the look of your device. 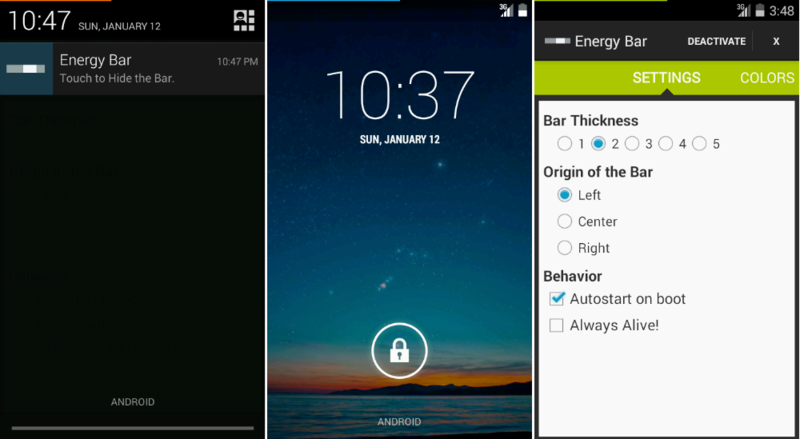 Well, that same bar is now available for all users without root on Google Play, and it is called Energy Bar. Energy Bar features a quaint little menu to help you change up the bar’s settings – it includes changes to the bar’s size, color, origin (left, right, or center), and the bar’s behavior. Our favorite feature is that you can have a multi-colored bar, which will allow the bar to change its color depending on how much battery you have left. For example, if your battery is full, you can have it set to green. Once it starts getting lower, it can change from green to orange, to yellow, and then to red when it gets really low. The app is completely free through Google Play, so go check it out.